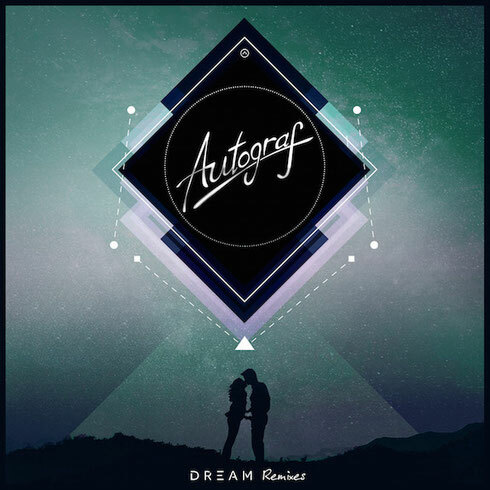 Autograf are starting September off with the release of a remix package of their first original single ‘Dream’. This collection of cuts from artists across the musical spectrum is available to download and stream now. Having invited seven up-and-coming producers to throw their hats into the remixing ring, they have managed to put together an eclectic mix of different sounds, styles and variations of their breakout single, ‘Dream’. First up is Boehm, a new producer fresh out of Bucharest, whose remixes of artists including James Vincent McMorrow and Martin Garrix, have apparently racked up millions of plays on SoundCloud and in doing so built the young Romanian a loyal following. His tropical take on ‘Dream’ starts the package off with a saxophone-laced mix that exudes summery vibes. Originally planned to be an unreleased radio-only edit, Autograf’s very own “Deep dub” has been playlisted on Sirius XM’s chillout channel all summer. Taking the original on a stripped down and dubbed out journey showcasing their ability and versatility has landed this remix on the package. LA based producer Fawks takes the reins next and whips the track into a fast-pace. With piano driven chord progressions and a jacked-up synth, the track is injected with a large shot of adrenaline. Taking things down a notch comes the turn of a new producer to come out of Canada – Pat Lok. His soulful and instrumental take gives the track a new depth and dimension whilst still echoing aspects of the original. Fellow countryman Robotaki, whose latest remixes have being doing well, adds his bass-fuelled touch to the mix. It’s had over 100,000 plays already and a premiere on HypeTrak. Dutch duo Deepend and Parisian club regular Gianni Kosta also weigh in on things with two deep house mixes. Last is Hairtage, the winner of Autograf’s remix competition, whose entry will now get an official release on Ultra Records. ‘Dream’, which was released earlier this year, has been given a new lease of life with these seven remixes that together give a snapshot of the musical talent on offer from Vancouver to Paris and from Bucharest to Amsterdam.